I started my museum career as an exhibit designer. There are many heroes I look up to in that field. But I reserve for Don Hughes that particular blend of admiration and fear that comes when encountering uncompromised brilliance. Don has been the head of exhibits at the Monterey Bay Aquarium for thirty years. He is a genius designer out of central casting: an artist, mercurial, funny, emphatic, honest, unflinching, with a disarming weakness for babies. The Monterey Bay Aquarium is a giant in our field, just as Don himself is a giant in the world of museum design. While I don't always agree with the Aquarium team's work, I always learn from them. Don is leaving the Aquarium, and he wrote this list of revelations on design to pass on to the next generation at that organization. He shared it with me, and he agreed that I could share it with you. One: Thou shall protect the original architectural design. The building and the exhibitions have a unique and historically successful relationship. Maintain this success by replacing worn or failing elements with materials as similar to the original as possible. Uphold the Aquarium’s overall industrial vernacular aesthetic. Two: Thou shall provide negative space to rest the eye. Well-meaning staff want to fill empty walls with important and meaningful messages. Prevent this. Our enduring design is simple and clean. It embraces the modernist philosophies of Less Is More and Form Follows Function. Three: Thou shall not restrict views of the bay. The building’s exterior is understated Cannery Row. The interior is polished industrial with rich appointments and allows for many views of Monterey Bay. Our building does not compete with the bay; it complements its natural beauty and power. Four: Thou shall keep the regional focus. The greatest stories ever told are always about place. The Aquarium is the most recent tenant of a location that humankind has used for thousands of years. Visitors flock to us to see live plants and animals from this place. Departing from this holy vision leads to damnation. Five: Thou shall have no greater god than visitors. Thou shall treat visitors like royalty, but thou shall not overestimate their interest or attention span. Visitors are not as interested as we like to think they are. Like life, communications with visitors is short, but staff’s list of meaningful, critically important topics to share is long—too long. Edit them. Six: Thou shall look like a museum and behave like an attraction. The Aquarium is confident. It doesn’t need to shout or brag. Our visitor experience is subtle, elegant and understated, not bold and in-your-face. We look more museum-like than Disney-like, and that makes us unique in a world of attractions. Like Disney in the world of theme parks, we set the standard for the world of public aquariums. Here, every visitor deserves a perfect visit, without out-of-order signs or beta-test experiences in the public space. We learn from our visitors, but not at the expense of their onsite experience. Seven: Thou shall beware of tacky idolatry. No penny crushers, flashy sales signs in the bookstores or cafe, no anthropomorphism or theme park-like costumed characters, no photo booths or other fads posing as content. Cast out those who want to squeeze more and more money from visitors. Dwell in the straightforward and honest presentation of nature. But don’t take thyself too seriously—use humor, and do not preach. Eight: Thou shall heed the words of the prophets. The Aquarium is on a peninsula not an island. Embrace the wisdom of Mickey’s Ten Commandments and Judy’s Visitors’ Bill of Rights. Nine: Thou shall remember the words of our father. Ten: Thou shall know all rules and revelations are created to be broken. The garden will change; it must. But resist the temptation of self-esteem. You are but a caretaker. Amen. p.s. from Nina: Do check out Judy Rand's Visitors' Bill of Rights and the accompanying speech that goes with it. 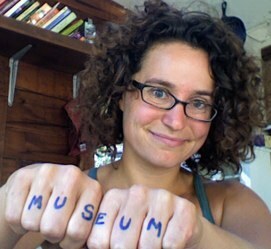 Judy is a tremendous exhibit developer, writer, comedian, teacher, and champion for museum visitors everywhere.